Increasing numbers of students with disabilities are participating in college and university courses. However, as a group, they experience far less academic and career success than their nondisabled peers (National Center for Education Statistics, 2008; National Council on Disability and Social Security Administration, 2000; National Science Foundation, 2012). A small but growing body of research suggests the efficacy of universal design of instruction (UDI) as a collection of instructional strategies that support the success of students with diverse characteristics. UDI practices include making expectations clear, employing multiple methods to deliver instruction, offering outlines and other scaffolding devices to support learning, and using multiple types of assessments (Burgstahler, 2015). A few studies have examined the effects of UDI for both faculty and students. Langley-Turnbaugh, et al. (2013) found positive outcomes among faculty receiving UD training to improve their teaching, Smith (2012) has reported a positive relationship between student interest and engagement and the application of UDI practices, and others have reported benefits of the practices as perceived by students (Kumar & Wideman, 2014; Zhong, 2012). Reports of research studies that compare overall student outcomes of the same course taught with and without the application of UD are beginning to appear in the literature. For example, Beckman (2009) offered two versions of a graduate course in information management, teaching one “traditional” section using lectures as the primary instructional method and one “treatment” section supplementing the lectures with small group discussions. Though the groups performed similarly on multiple-choice and fill-in-the-blank exam questions, suggesting comparable mastery of factual material in the two sections, students in the treatment group performed better on essay exam questions, suggesting an enhanced ability to use the information, and these students more frequently reported that “the instructor was open to a variety of points of view.” However, this study did not compare the relative benefit of UD practices for students with disabilities as compared to those without disabilities. The purpose of the current study is to test the hypothesis that UD teaching techniques can support students with disabilities in earning better grades, making them closer to those of their nondisabled classmates. The Center for Universal Design in Education. As AccessCollege activities unfolded, faculty requested examples for the application of UDI to specific instructional products (e.g., textbooks, videos, websites) and environments (e.g., classrooms, computer labs, online learning). In response to these requests, DO-IT, with input and vetting from project partners, operationalized UDI into a checklist of promising practices that demonstrate how UD can be applied to the overall design of instruction and specific aspects of the learning environments. In addition, this material assists with the determination of accommodations when universally designed instruction does not fully address the needs of a specific student with a disability, such as when a student needs a sign language interpreter or extra time on tests. The publication that listed UDI practices was distributed in most professional development offered to faculty as part of the AccessCollege project (Burgstahler, 2015). The third AccessCollege project focused on outcomes and impact of faculty training. It included the delivery of 184 professional development presentations and workshops to more than 2,210 faculty and 126 teaching assistants on campuses and at professional conferences nationwide. Researchers in the project sought an answer to the question: Does the application of UDI practices result in leveling the academic playing field for students with disabilities? This question was operationalized into the following research question: Does applying UDI techniques in a class result in reducing the gap between the grades of students with disabilities and those without? Instructors at six Washington State colleges volunteered to receive UD training and participate in this study. Training was provided by an AccessCollege Team member who was hired to train faculty on multiple campuses on UDI methods. She also worked with the project evaluator to collect grade data for students in these instructors’ classes and in the classes of their “matched” colleagues as described below. The training, which ranged from 1–3 hours in length, took place at a variety of community and technical colleges. Faculty who engaged in the training did so voluntarily once the training option was announced. The presentations included a description of UD and of UDI, examples of UDI strategies, a video demonstrating UDI strategies, and further resources on the Universal Design in Education website. Each presentation was followed by a discussion. Trained faculty taught a wide variety of courses as summarized in Table 1. A contact at each school provided GPA data for the students in the classrooms of each of the trained instructors, as well as for the students in classrooms of comparison instructors teaching comparable classes. Data collection and analysis involved 6,550 grades from 269 classes taught by 42 instructors who received training and 55 instructors who did not, but who taught comparable classes in the same department in the same institution during the same time period. The 42 instructors who received training assigned grades to 1,379 students (65 with documented disabilities) in targeted classes prior to the training they received, and to 1,457 students (95 with documented disabilities) after they received training. The comparison faculty assigned 1,611 students (102 with documented disabilities) prior to their colleagues’ training and to 2,103 students (129 with disabilities) after their colleagues’ training. A subset of this dataset was used for the analysis. Only classes with grades available for at least one student with a documented disability were included in this analysis and, of these, only those with data collected from classes taught both before and after the faculty training period. Of these, the only classes included in the study had at least one matched comparison instructor whose classes also met these data requirements. After the application of these restrictions, 126 classes remained, yielding 264 grades for students with disabilities and 3,066 grades for students without documented disabilities. Forty-three of these classes were taught by faculty who received training (16 of the classes were taught prior to the training; 27 after), and 83 of the classes were taught by matched comparison instructors (30 of them prior to their faculty match’s training, and 53 after). The research question—Does applying UDI techniques in a class result in reducing the gap between the grades of students with disabilities and those without?—was investigated using a quasi-experimental 2X2X2 research design. The three factors in the design were student disability status (students with vs. students without a disability); faculty group (trained faculty vs. “matched” faculty without training); and timing (before and after the training period). The dependent variable was average course grade. Figure 1 illustrates the design, showing each two-way dichotomy. The first (top-bottom) dimension represents Student Disability Status. The top four cells hold the GPAs of the students with disabilities while the bottom four cells hold the GPAs of the students without disabilities. The second (front-back) dimension represents Faculty Group. The front four cells hold the GPAs of the students in classes of UD-trained instructors and the back four cells hold the GPAs of the students of the comparison instructors who did not receive UD training, but taught similar courses. 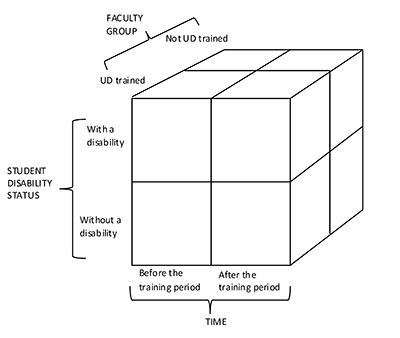 Note that the UD-trained instructors (front four cubes) taught students with disabilities (top two cubes) and students without disabilities (bottom two cubes), as did the comparison instructors. The third (left-right) dimension represents the pre-post dimension of the design. The left four cubes hold the students’ GPAs before the training period and the right four cubes hold the students’ GPAs after the training. Looking again at just the front four cubes (the classes of the UD-trained instructors), the top two cells hold the GPAs of the students with disabilities before the training (left cube) and after the training (right cube). The bottom two cubes represent the same information for their classmates without disabilities. The back four cubes provide the same information, for students with and without disabilities, during the same timeframe, but in the classes of the comparison instructors. The reason the researchers gathered pre and post data for the comparison instructors when they received no intervention between the two periods was to ensure that any changes found in the GPAs of students in the UD-trained classes were not due to some campus-wide or community level phenomenon. Thus, the average GPA of students with disabilities and the average GPA of students without disabilities were computed and recorded for each course, before the training period (left half of the cube) and after the training period (right half of the cube). For analysis, the patterns of change in average GPA of students with vs. without disabilities from pre- to post-training were compared to determine whether the grade gap between students with and without disabilities decreased after the training. These GPA changes were compared with those in the classes of comparison instructors who did not receive training but taught similar courses to ensure that any changes found could not be explained by some campus- or community-wide change during that time period. Class was the unit of analysis. Thus, the analytic database consisted of the average GPA for students with disabilities and the average GPA for students without disabilities for each class. Figure 2 presents data from the classes of faculty who received training. It illustrates the change from before the training to after the training in average course GPA for students with disabilities and for students without disabilities. The average GPA of the students without disabilities (the first bar in each pair) was about the same pre-and-post faculty training (2.7 and 2.6, respectively). The average GPA of the students with disabilities in the same classes (the second bar in each pair) increased from an average of 1.8 to an average of 2.5. This change brought the average GPA of the students with disabilities close to that of the students without disabilities. Analysis of data presented in this figure reveals that, overall, the grades of the students with disabilities were significantly lower than those of their non-disabled classmates (F(1,41)=7.9; p<.01) and that the increase in average GPA from pre- to post- faculty training among the students with disabilities is unlikely due to chance: (F(1,41)=5.9; p<.05). Figure 3 presents similar information for the classes taught by the matched comparison instructors who did not receive training. It shows that, overall, the average GPAs of the students with disabilities are significantly lower than those of their non disabled classmates (F(1,81)=5.7; p<.05). However, unlike the classes of the trained instructors, the lower grades of the students with disabilities did not improve to match those of their non-disabled classmates over the same time period. This result suggests that the training had a significant impact on the ability of the instructors to better teach students with disabilities. In summary, the grades of students with disabilities in classes taught by faculty who received training increased while the grades of their non-disabled peers did not change. In contrast, the grades of both groups of students in courses taught by untrained faculty stayed the same or decreased somewhat. Thus, only the grades of the students with disabilities in the classes of the trained faculty increased significantly after the instructor received the training, bringing the performance of students with and without disabilities taught by the trained faculty to similar levels in the post-training period. It should be noted that the pre-training grades of students with disabilities were much lower than those of students with disabilities in the comparison faculty classes. It is unknown whether this was random fluctuation in the data or due to systematic differences between faculty in the two groups. It is possible that the faculty who received the training recognized that they needed it and found it effective, or it could be that the results are simply due to random fluctuation in the data and regression to the mean. Replication of this study might shed light on this issue. A weakness of a study like this is that it was conducted in courses that do not include enough students with a wide range of disabilities to analyze an intervention’s success with specific sub-groups. Also, although the results indicate an apparent effect of the intervention, no assessment was made to determine which UD practices, if any, the trained instructors employed nor the value of specific UDI strategies. More and larger research studies are needed to further explore these issues. UDI is often promoted as a means for leveling the playing field for students with disabilities in higher education. However, research reported in the literature rarely addresses the question of whether employing UDI practices brings the performance of students with disabilities closer to that of other students. Data collected in this study suggests that professional development and resources offered to faculty as part of the AccessCollege initiative increased their ability to level the academic playing field, resulting in decreasing the gap between the earned grades of students with and without disabilities. Kumar, K. & Wideman, M. (2014). Accessible by design: Applying UDL principles in a first year undergraduate course. Canadian Journal of Higher Education, 44(1), 125–147. Smith, F. G. (2012). Analyzing a college course that adheres to the universal design for learning (UDL) framework. Journal of the Scholarship of Teaching and Learning, 12(3), 31–61. Zhong, Y. (2012). Universal design for learning (UDL) in library instruction. College & Undergraduate Libraries, 19, 33–45. This article is part of the collection Universal Design in Higher Education: Promising Practices, sponsored by the DO-IT Center. The report was written with the support of funding from the National Science Foundation under Grant #HRD-0929006. Any opinions, findings, and conclusions or recommendations expressed are those of the author(s) and do not necessarily reflect the views of funding sources or the DO-IT Center. Copyright © 2015 University of Washington. Permission is granted to copy and distribute these materials for educational, noncommercial purposes provided the source is acknowledged. Burgstahler, S., & Moore, E. (2015). Impact of faculty training in UDI on the grades of students with disabilities. In S. Burgstahler (Ed.). Universal design in higher education: Promising practices. Seattle: DO-IT, University of Washington. Retrieved from www.uw.edu/doit/UDHE-promising-practices.